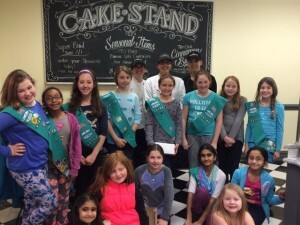 Signal Hill Elementary School’s fifth grade Junior Girl Scout Troop #30108 recently kicked off their annual cookie season with Signal Hill alumna, Holly Aducat at her bakery, The CakeStand located on Evesham Road in the Avian Shopping Center. Holly talked to the girls about being a young woman owning a business and then let the girls get down to some yummy business of their own. Holly and her pastry chefs led the girls in creating delectable sweets using their Girl Scout cookies. Some treats included thin mint brownies and buttercream lemonade sandwich cookies. Girl Scout cookie season runs through March 8. Cookies are $4 each, and $5 for the new gluten free cookies.